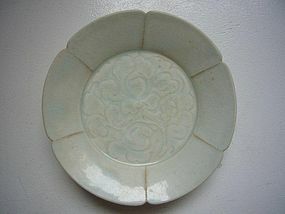 A very nice Qingbai plate in the shape of a flower, the center with a very fine carving of a peony. China, Song Dynasty (960-1279). Diameter 14,5 cm. Condition: excellent with normal age wear.